The newest multitalented water wand from HYDE delivers a trifecta of weeding, feeding, and watering capabilities that will help your lawn and garden survive the summer. Summer teases us with warm breezes and long days just perfect for relaxation and repose. But for many homeowners, too many so-called “lazy” summer days are spent performing the backbreaking work necessary to maintain or beautify the yard. When you’re not straining to spread weed killer on the grass or direct water into awkwardly positioned planters, you’re hunched over scrubbing the patio furniture or cleaning the sidewalk. If you’re ready to take a vacation from all this strenuous summer activity, look no further than the HYDE PivotPro Garden Wand Kit for your salvation. Whether you’re tasked with weeding, feeding, or watering the garden, or just tidying up around your property, this must-have multi-tool—complete with a pivoting three-setting spray nozzle and a weed-feed additive dispenser—can eliminate the stress and fatigue of getting your lawn and garden in tip-top condition. Unsightly weeds can be hard to reach and even harder to tame when they grow in hilly terrain or in awkward nooks and crannies of the lawn. Add to this the difficulty of pushing a weighty walk-behind spreader up and down those same slopes, and it’s easy to see how applying weed killer could seriously strain your arms, legs, or back. If, however, you swap out the standard spreader for the lightweight HYDE PivotPro Garden Water Wand, which attaches to an unrolled hose, you can weed the lawn at your own pace and in a comfortable, upright position. To make the most of this smaller and smarter garden helper’s weeding capabilities, start by connecting the PivotPro to your garden hose. Then, simply pour the liquid weed-control concentrate of your choice into the tool’s 16-ounce weed-and-feed additive dispenser. Set the liquid ratio dial to the concentrate-to-water ratio recommended by the product’s manufacturer, and toggle the mix control switch to the “on” position. 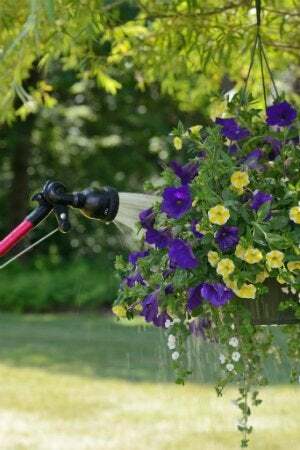 Water from the garden hose will dilute the concentrate as you work your way down an overgrown sidewalk or along the edge of the garden, gently sliding the handle to adjust the spray angle. Thanks to the wand’s 135-degree pivoting nozzle, you’ll have easy access to tight corners and narrow corridors, and even around irregularly shaped bushes. When you’re finished weeding, there’s no need to switch out tools before you tackle your next seasonal to-do. Because you can remove, wash, and refill the detachable dispenser with any additive, you can put the PivotPro Garden Water Wand—the same one that you just used for spreading weed killer—to work fertilizing your lawn. The tool’s versatility means that you can save time, money, and storage space. After you’ve thoroughly cleaned out the weed-killing concentrate from the dispenser, refill it with fertilizer concentrate. Here again, you have full control (and flexibility) when it comes to the feed-to-water ratio your plants require. The wand’s automatic liquid ratio adjustment mechanism ensures optimal fertilizer spread with no measuring, calculations, or manual premixing required on your part, so you can transform your nutrient-starved grass into a luxurious lawn in a fraction of the time it used to take. While the PivotPro Garden Water Wand delivers a quick one-two punch of weed killer and fertilizer to a lackluster lawn, it can just as easily be used to rinse or clean countless items throughout your yard. Toggle the mix control switch on the wand to the “off” position, so its nozzle will spray only plain water. The jet, fan, and shower modes of the three-setting spray nozzle—as well as the wand’s 46-inch reach—offer remarkable flexibility: You can direct a gentle mist over the rim of a hanging planter, then maneuver down to ground level to hose off dingy tools, shoes, or garden furniture with a powerful jet of water. Better yet, fill the dispenser with soapy water to turn the PivotPro into an all-purpose cleaning tool for all seasons! Wherever you put it to use, the PivotPro Garden Water Wand can help you attain greener pastures on your own home turf. Purchase HYDE PivotPro Garden Water Wand, $39.99. Watch the video below to see the HYDE PivotPro Garden Water Wand in action!